Get ready for the official sequel to the 1970s grindhouse classic. Paul Bartel's 1975 masterpiece Death Race 2000 is the very definition of a grindhouse movie. Set in a dystopian future where the public is sated by an annual race in which drivers are rewarded points for mowing down pedestrians, it's a movie that has to be seen to be believed. Director Paul WS Anderson remade the film in 2008 as Death Race, with two sequels - Death Race 2 (2010) and Death Race 3: Inferno (2013) - following, but now we have an official sequel, with the legendary Roger Corman back on board as producer. Universal will release Death Race 2050 on digital download on March 6th, and on blu-ray and DVD on March 20th. 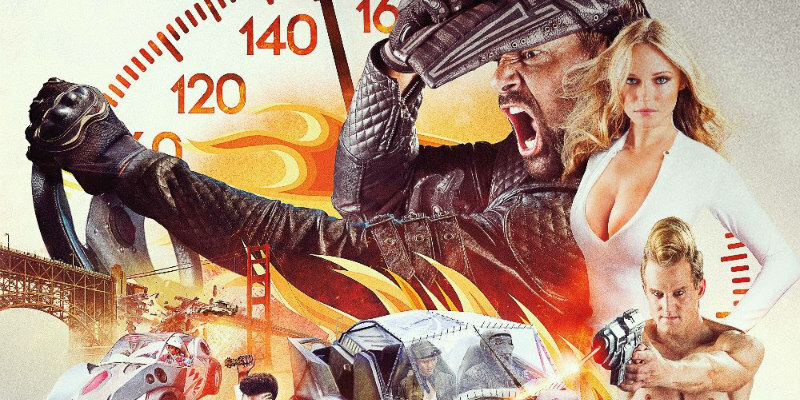 A delirious blend of high-octane action, razor-sharp political satire and full-throttle mayhem, Roger Corman’s Death Race 2050 arrives on Blu-ray™ and DVD on 20th March from Universal Pictures Home Entertainment. The film will be released on digital download from 6th March, 2017. The highly anticipated reboot of the cult classic Death Race 2000, the Universal 1440 Entertainment original production straps viewers into the driver’s seat of the ultimate auto showdown, a blood-splattered no-holds-barred virtual-reality show that gleefully pits hardened road warriors against each other — and their audience. Exclusive bonus features reveal how filmmakers transformed the deadliest competition on wheels into a hair-raising, savagely funny game of life or death. Legendary filmmaking icon, Roger Corman, is back with his most outrageous film yet in this sensational, action-packed and darkly humorous reboot of the original Death Race 2000! It’s the year 2050 and America is controlled by an all-powerful corporate government ruled by The Chairman (Malcolm McDowell). The masses have been brainwashed with violent virtual-reality entertainment. The event of the year is the Death Race, in which a motley crew of violent drivers compete in a cross-country road race, scoring points for shamelessly running people over and driving each other off the road. The reigning champion and fan favorite, Frankenstein (Manu Bennett), who’s half-man half-machine, wants to take the crown, but his rebel spy co-pilot threatens his legacy. Produced by Roger Corman, the king of cult classics, Roger Corman’s Death Race 2050 stars Manu Bennett (The Hobbit) as Frankenstein and Malcolm McDowell (A Clockwork Orange) as the Chairman. The cast also features Burt Grinstead (“NCIS”), Marci Miller (Viper), Folake Olowofoyeku (The Beaver), Anessa Ramsey (Footloose), Yancy Butler (Hard Target) and Charlie Farrell (Cantar). The Making of 2050 – This featurette goes behind the scenes of Roger Corman’s Death Race 2050 to explore why, over four decades later, the original Death Race 2000 has been remade, including what made this project appealing to cast and crew, what changes have been made, and what fans of the original will still love. Discover the movie magic behind the deaths, stunts and of course — the cars! Includes interviews with stars, director G.J. Echternkamp and Corman himself. The Look of 2050 – An insider look at how the film’s visual style came together, including how shooting in Peru helped set the tone of the picture and how the costumes became stars in and of themselves.